I am sitting here in filtered sunlight typing away in a coffee shop in Brunswick Heads in Northern NSW, Australia. 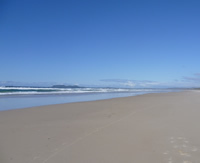 The other day my partner and I walked from Bruns to Byron Bay – a three and a half hour journey on an absolutely splendid beach (see pic). It was most pleasing and soul-stirring. In fact the whole area of Northern NSW has a very effecting chillout vibe so we fit right in. The sub-tropical rainforest walks in the hinterland are some of the most enchanting forest walks I have done anywhere in the world – so full of life and intense greenness. It’s impossible to feel anxious about the world when you are immersed in such a bounty of seemingly unspoilt nature. With relaxation in mind I want to point out the music of Michael Wild. Michael is my brother and (some may consider a slight bias;) I believe he creates some of the most beautiful healing music in the world – and we now celebrate the 25thanniversary since his first release – see Inspired by the Heavens 2CD below. His style is free-flowing ambient music that countless thousands of people around the world have used for relaxation, healing and pure listening pleasure. With the use of long tracks each album creates a tranquil space of gentle flowing music. Michael’s compositions are unique with the absence of any strong melody or jumps in volume. This is very compelling for your body and mind when creating a healing space – perfect for any therapeutic sessions such as massage or simply for meditation and quiet times. Click HERE for quotes of what people say about Michael’s music.